The Ife traditional council in Osun State has officially confirmed the death of the Ooni of Ife, Okunade Sijuade Olubuse II, after denying that the monarch had passed away. The Awara of Iwara-Ife, Layi Adereti, made this known in Ife while speaking on the preparation for the burial of the Ooni, who died at Saint Mary Hospital in London about two weeks ago. He said the official proclamation of the passage of the Ooni of Ife would be made on Wednesday 12th August 2015. The traditional ruler said the Oro festival was the final rite of passage for the Ooni, declaring that the final pronouncement of the demise of Ooni has been fixed for Wednesday between the hours of 9am and 4pm. “This is an official statement from the palace of Awara of Iwara-Ife who is the head of Oro deity that on Wednesday 12th August 2015, there would be official proclamation of the demise of Ooni of Ife,” he said. “The proclamation will be made public during the Oro festival, being the final rites on the demise of Ooni of Ife. “The residents of the ancient town are therefore urged to keep away from the streets between the hours of 9am and 4pm during which the Oro diety will be out. Mr. Adereti who is also the head of Oro Cult in Ile-Ife, noted that residents of the ancient town whether male or female would remain indoors during the Oro rites. According to him, immediately after the Oro rites and the proclamation, subsequent rites would follow. 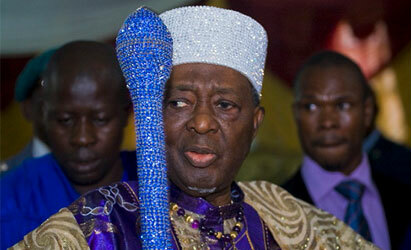 He appealed to all residents of Ife to heed the restriction orders from the palace. The monarch added that though only females were normally barred when Oro festival is being carried out, but this time around, it would have no respect for gender. The council had been in denial since the news of the Ooni’s death broke, claiming that its traditional rulers don’t die. Many of the Chiefs were also embarrassed by the fact that the media reported the passing, instead of the traditional channels established by aged long customs of Ife land.